Diet and exercise sometimes do little to eliminate unwanted fat and loose skin in the abdominal area. They are also ineffective for stretch marks. If you are bothered by these appearance problems, abdominoplasty (tummy tuck) may be a good choice for you. Abdominoplasty is performed to rid a person of excess skin and to tighten the weak abdominal wall muscles. This is frequently present in women following childbirth or great weight loss. The procedure is done as an outpatient surgery and sometimes can be done as a “mini” abdominoplasty, which works mainly on the lower portion of the abdomen (a “mini” procedure involves a limited skin excision of the abdomen below the belly-button in combination with liposuction). For a full abdominoplasty, I begin by making a long incision from one hipbone to the other, and then make a second incision to remove the naval from surrounding tissue. The skin is then separated from the abdominal wall and the abdominal muscles are pulled closer together, tightened, and stitched into a new position. After this, the skin is stretched back down over the abdomen and extra skin is removed. A new hole is cut for the belly button and it, along with the original incision, is stitched. After surgery is performed, dressings and bandages are used and drainage tubes are used to help drain additional fluid. A compression garment is required to help limit swelling for several weeks. Recovery period is anywhere from 10-21 days, depending on the extent of the procedure and the tightening of the abdominal wall musculature. Liposuction is frequently performed, and other procedures such as breast augmentation or lift can also be performed at the time of this surgery. I cannot perform aggressive liposuction of the midline abdominal fat at the same time as a full abdominoplasty since the blood supply to the tissues can be compromised. 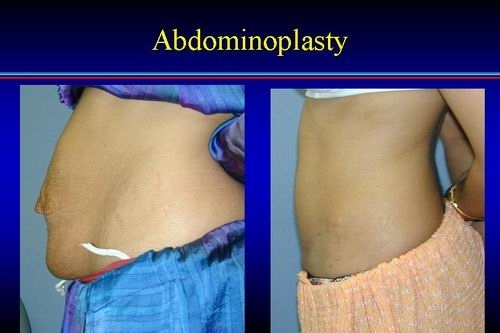 I perform abdominoplasty as an outpatient procedure. The average cost including anesthesia and facility fees is ~ $9000-10,000 (depending on the extent of the surgery and the amount of liposuction included). Prescriptions for pain medicine and antibiotics would be extra, depending upon your insurance company, and I recommend that all of my patients buy some compression girdles for the immediate post-operative period. We also offer financing through companies recommended by the American Society of Plastic Surgery (please click on the financing button on this web site). Combined procedures are less expensive. Ultimately it would be best if I met you in person to give you a better idea about what type of surgery you might need. Please contact my office at the number listed below my name to schedule an appointment. Alternatively you can e-mail my patient care coordinator at valerie@clevelandplasticsurgery.com. The general risks of surgery include but are not limited to: bleeding, infection, injury to surrounding structures, asymmetry, hypertrophic/keloid scarring, prolonged irritation, and peri-operative anesthetic complications. The specific risks include sensation changes to the abdominal wall, wound healing complications to the lower abdominal wall or belly-button, recurrent laxity of the tissues, blood clot in the legs, and need for further surgery. That being said, most patients do very well with this surgery. I would be more than happy to see you in my clinic where I can also show you more pictures of my patients and explain the procedure in greater detail. The pictures below (click on the orange words) are good examples of how differences in a patient's body and starting size influence the outcome.